Click this link to download a full PDF version of this whitepaper to read offline. Flight training as a business has been going through changes in the past few years. In some respects, it is growing up and becoming a more stable, more mature business offering training for students seeking career pilot employment. These changes are consolidating where training takes place and include fundamental changes in the approach that must be taken to successfully provide career focused training. With these changes there has been a shift away from a traditionally smaller footprint, local airport, business model to one that is focused an economically successful model while continuing to provide output of pilots needed to meet industry pilot hiring needs. As flight training for career focused pilots funnels more would be professional pilots to academy, collegiate and university, and large footprint training providers, this change allows businesses to actively take advantage of economies of scale in training with respects to overhead, assets utilized in training, and securing of adequate staff to provide the training services. A realistic evaluation of the flight training business will recognize that the historic methodology of providing training at small scale training providers with minimal flight instructor staff and limited aircraft resources is not able to meet the current modern demand of output for career pilots. Lack of standardization in training, lack of available funding for pilot trainees, and lack of full time instructors to provide training result in training delays and cost increases for customers seeking training. These and other detracting considerations often drive customers seeking professional pilot careers to overlook any convenience that might be gained by training close to home with many smaller scale training providers. Many of these customers now seek training from larger scale training providers, even if it means travelling to the training. In addition to efficiencies and conveniences provided to customers by larger footprint training providers, many of these providers also have developed strong partnerships with airlines and other professional pilot employing companies. These hiring relationships are developed as employers seek to fill professional pilot positions and develop recruitment relationships with the training providers that are putting out the largest number of certified pilots who may be employable. Doing this allows potential employers to maximize their hiring efforts by recruiting pilots from training providers who are putting out large numbers of applicants (hundreds and in some cases thousands per year) instead of having to visit multiple smaller training providers who are putting out only a few pilots per year, which can increase the human resource cost of recruitment. As the customer base for training becomes more savvy, these hiring relationships are seen as reasons to seek training from particular training providers and the market of customers further funnels from local small scale training providers to larger providers. Some of these providers have national scale training operations. Larger scale civilian training operations with larger customer bases represent more mature business training models than the flight training industry has relied upon for much of the history of recruitment for professional pilot positions, especially for airline employment. As the airline industry and other professional pilot sectors rely more upon the throughput of trained pilots from the civilian flight training sector, it becomes more critical that the business models of these training provider be sound and able to continuously deliver their product, trained and qualified pilots. The flight training market has effectively experienced a split over the past two decades between more local or specialized individual training providers focused on individual customers who are frequently seeking pilot training for pleasure and business flight activities and larger scale, production focused training providers. These larger training providers develop larger systemic approaches to training that are less individualistic and more syllabus based, in many cases FAA approved FAR part 141 training curriculum systems. They provide uniform training that is delivered the same to all of their customers (students) and less focused on a the individualistic needs of a specific student. It is these providers that are providing the greatest numbers of students who complete certificates and/or ratings that qualify them for employment as professional pilots. In one particular case, one such training provider who has multiple locations around the United States singularly provided training and practical test recommendations to more than 7% of the total number of pilot certificates issued in a given year for at least two successive years. If we were to consider the top producing providers throughout the country, I would expect a relatively small number of training providers would represent the majority of recommendations for pilot certificates when compared with total numbers given in any recent year. In the past, significant numbers of pilots were able to be secured from military retirements or, even back further, from pilots who transitioned out of wartime flight service into the civilian flight service operations. As our military has contracted, this is no longer the case. The bulk of qualified pilots being hired by airlines are receiving their initial training at commercial and university/collegiate training providers. It is to these civilian training environments that recruiters look for employees. Contraction of military pilot resources is not the only reason for a change in this training environment. Pure economies of scale in businesses that provide flight training also make training more likely to be cost-effective at larger training providers. Along with economies of scale, some other business operational considerations also drive training to congregate in some locations instead of others. Weather conditions around the country are more suitable to flight training year round in some places than others, and a result has consolidated some of the largest training operations to places like Florida, Arizona, Texas and Southern California to name a few. More flyable days means a business that provides flight training can operate more days of the year and be more profitable. It is no coincidence that the highest density training environments tend to be where weather is more conducive to active pilot training with but a few exceptions. As businesses providing flight training increased their size, they were able to maximize economies of scale and increase their profitability when run properly. A business that has 30 aircraft and 60 instructors has the potential to complete more pilot training than a local FBO that has a singular aircraft and 2 instructors. While at some point more students means a need for more assets, staff, and/or physical space, it also allows a business to decrease the burden of customer cost per student by spreading fixed overhead costs over more customers. This fundamentally results in a more profitable business model and an ability to offer competitive pricing to the customer. If you have any doubt that this principle is at play in the business environment, ask your local “mom and pop” hardware store owner (if you still have one) if they think they can compete on price with Home Depot or Lowes. This doesn’t mean that local flight training is gone for good, but it may provide a different product than that of academy or collegiate/university career-focused professional pilot training program is going to provide. Personalized, pleasure and business, aircraft specific owner/operator focused training is provided in large part by local airport based and/or FBO or individual instructor training businesses. Some of these are highly specialized based on a manufacturer or make and model of aircraft and are focused on the desire by a personal pilot to accomplish a certificate and/or rating or transition training into the operation of a personal and/or personal business flying operational environment. This training is in most cases provided by a singular instructor with whom the customer works as long as possible until the training is accomplished. Career-focused, professional pilot training is channeling more and more to larger academy and collegiate training sites where standardized staff are more interchangeable, ground training may be taught by instructors other than those who provide the in flight training, and the customer has little if any choice in the type of aircraft that will be used for the training. That decision is made by the business for a fleet consideration to accomplish training under a syllabus. This training is less focused on working with one specific customer and their individual goals than it is of working with a type of customer and producing a consistent product of student that is broadly employable after the training is completed. In many instances, this training is less local, and instead training that customers must move to seek completion. Career-focused customers pursuing training are taking advantage of the benefits these larger training providers provide. Local FBO airport training is more frequently focusing on local pilots who seek to learn or advance their pilot skills for pleasure and business flying purposes more than becoming employed as a professional pilot in something like an airline environment. With this split, instructors who are seeking to build time to become employable in professional airline careers are also selecting to work for these larger training providers. This allows them to more quickly gain the requisite flight hours to move on to other positions. By doing this, many local airports and FBOs that are attempting to provide flight training are left with few if any flight instructors to do so and many of the larger training providers are experiencing rapid turnover of their CFI employees. In some cases, savvy new CFIs are even leaving places they trained that are in desperate need of instructors to go work in other locations around the country where the weather allows CFIs to more quickly accomplish completion of requisite hours to move on to other positions. An instructor in Michigan may find that during a winter season they can only gain 200-300 hours of flight time while one in Texas may average 600. Instructors talk with each other and some are taking advantage of these opportunities, in some cases leaving flight training providers in areas where inclement weather is more common having a harder and harder time filling their instructor staffing needs. The changes that have taken place in our industry have also seen changes in the trends of our CFI population. This affects our training capacity and the ability of businesses to provide their training services through the employment of CFIs. Trends in the overall pilot population are closely tracking to what is being experienced in the CFI community, with one significant difference, that of the total population. 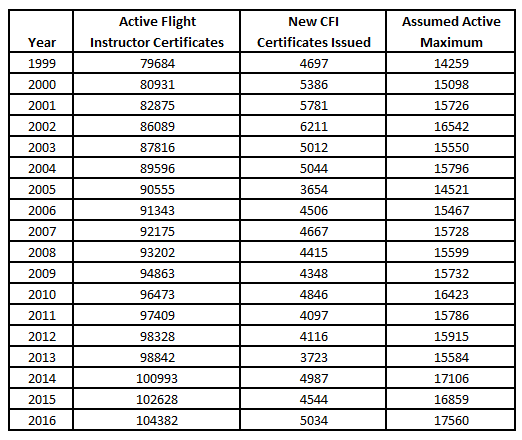 While the overall certificated pilot numbers have trended downward over the past few decades, the overall numbers of “active” CFI certificates on a yearly basis has actually trended upward. 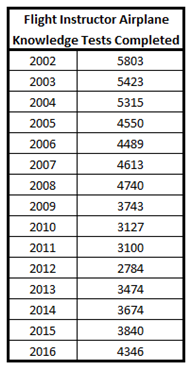 If we look at the number of active CFI certificates, defined as having been renewed within the last two years (which is required to remain a current CFI certificate), we see that the overall number of CFIs has increased by nearly 25,000 CFIs in the last 15 years. 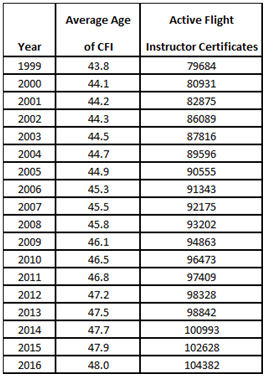 Over the same period of time and beyond, the overall certificated pilot population has decreased. To contextualize this, we see that over the same time period there has also been an “aging” of the CFI population with the average age of the CFIs over the same time period increasing from under the average age of 44 to the age of 48. With this being the case, we are finding that these middle aged CFIs are less likely to be actively engaged in providing flight training in the training providers that are engaged with throughput career-focused training in the majority. Many of these middle aged CFIs are employed as professional pilots in jobs such as airline service and keep their CFI certificates active simply in an effort to not lose them based on FAA regulatory requirements. With the increasing number of CFI, but the aging of the grouping, we see that a significant percentage of the CFI grouping is over the age of 40. 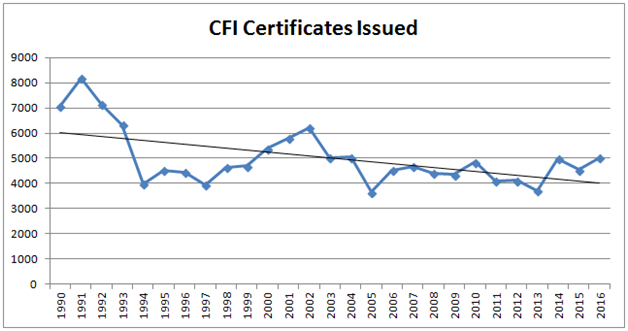 Along this same time period, we are actually seeing a decrease in the number of the CFI certificates being issued on a yearly basis. This is visible in data on both the number of CFI knowledge tests being administered on a yearly basis and in the number of initial CFI certificates being issued on a yearly basis. 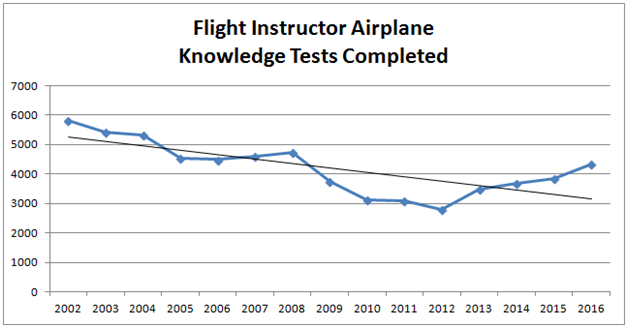 As the trend of CFI certification numbers decreases, and the overall age of the population increases, we are left as an industry with a CFI population that is aging, does not consist of CFIs who are actively engaged in the day-to-day provision of instruction, and in general, decreases the number of available CFIs to be employed by flight training providers. It is typically younger CFIs who are engaged with highly active CFI activities in an effort to gain experience to become employable in other professional pilot career options. With this change in dynamics of the CFI community, we find that there are fewer potentially employable CFIs to be hired by flight training providers and that they have a harder time filling needed employee positions to provide training to customers seeking training for pilot certificates and ratings. This directly affects the business processes of flight training providers. Considering the fact that there is a general downward trend in CFI certification on a yearly basis and an increasing average age of the CFI population, we can correlate this with an assumption, if not assertion, that the CFI population, while up in overall numbers, is not increasing in numerical relation to those CFIs that actually are providing training to future pilots in largesse. Most of the CFIs that are “currently” certificated are older and either actively employed as professional pilots and keep their CFI certificates “active” instead of losing them, in many cases using Flight Instructor Refresher Course (FIRC) based renewals. Many are beyond retirement ages. These CFIs are not typically providing training at what I will call throughput training providers. In fact, a minimal percentage of the overall CFI community meets what should be considered “active” CFI levels. While the FAA defines an “active” CFI as one that has a current CFI certificate which must be renewed every two years, a more functional definition when considering training throughput potential might be one that considers if a CFI has signed off an applicant for a pilot rating or certificate within the past two years. But data on what exactly is an “active” CFI has hard to come by or drill down to in order to figure out how many really are “active”. The FAA doesn’t report or track CFIs that are actively engaged in training. What we do know is that while the overall number of CFIs has been growing numerically on a yearly basis, the number of “new CFI certificates issued” each year is relatively low and from a percentage basis small. Considering the fact that a CFI must renew their CFI certificate every two years, and that historically we haven’t seen more than approximately 10-15% of CFIs signing off students for practical tests within a two year period, we can back into a number that may approximate the number of CFIs who are more or less active. From this data, we find strong probability that far less than 20% of CFIs are probable to be engaged with what we will call “throughput training” for pilots seeking ratings and certificates. On a yearly average, it would indicate that approximately 17% of the CFIs who have certificates may be actively engaged in providing training on any given year. At the time of the writing of this paper, of the 104,382 CFI certificates that are current, only 80,688 have an active medical certificate (that data point provided by the FAA). This means that approximately 77% of CFIs could provide training for pilots seeking ratings or certificates that require the CFI to have a medical, which is most of the certificates and ratings that develop throughput training at flight training providers. While some will argue that the other 23% “could” be providing training for things like CFI certificates and/or commercial pilot certificates, it is my practical experience in the industry that this is a very small minority of CFIs who engage in this type of training without a medical certificate. What is more likely, is that the vast majority of these CFI certificate holders are of a senior age and no longer actively engaged in flight training provision, but keep the certificate active instead of losing it through a renewal process such as a flight instructor refresher course that must be completed every two years. In another “gut check” of this level of activity, we can consider how many CFIs actively renew their CFI certificates based on completion of a FIRC course because they do not meet student sign off activity levels required to renew on that basis. To qualify for renewal of a CFI certificate based on student sign-off activity a CFI need only sign off a minimum number of 5 students in a two-year period (with a greater than 80% pass rate). CFIs who are not doing this minimal number of sign-offs in a preceding two year period are doing little to impact the real production of new pilots into the system. While the FAA does not publish data specifically that indicates the number of CFI renewals based on FIRC course completion, I have been able to closely approximate the number of CFIs who complete online and in person FIRC courses on a yearly basis through discussion with FAA staff and the FIRC program providers. A reasonable estimate seems to indicate, within a 5% deviation. that on a two year basis around 78,000-82,000 CFIs are completing a renewal based on a FIRC within recent years. This further backs up the approximation I have proposed above by closely correlating to the numbers of estimated CFIs who would be actively engaged in providing training that results in a signoff for a rating or certificate. It is these CFIs that are providing throughput based training that is creating newly certificated and/or rated pilots that are potentially seeking professional pilot careers based on the training they have received. These factors typify our understanding of the fact that it is percentage of instructors who have been certificated for longer periods of time, and a majority of instructors who are “newly” certificated that are providing the highest percentage of training in businesses that base their model of flight training on career-focused customers. With the exception of a few long term senior instructors at these businesses or academic institutions, the bulk of these instructors are employed after recently accomplishing their CFI certificates and use this work as a method to gain the requisite experience to become employable at other professional pilot employers. With this in mind, as soon as these CFIs gain the requisite experience to be employable in alternate pilot positions, such as airlines, they leave their CFI positions for other jobs. This has created active and aggressive turnover in CFI positions for many flight training providers in the United States as their CFI employees stay in those positions only long enough to gain the experience to move on to other employment options that provide better pay, better benefits, and longer term career options. When this turnover was evaluated considering the length of time that a flight instructor is typically staying in a flight instructor position, it was found that when averaged across a variety of flight training providers, most instructors stayed in a CFI position an average of 9-10 months. This means that a flight training business needs to “rehire” a position at a minimum of every year. With this rehiring comes costs to the business to recruit, retain, and standardize those staff members who are CFIs to provide training to their customers. 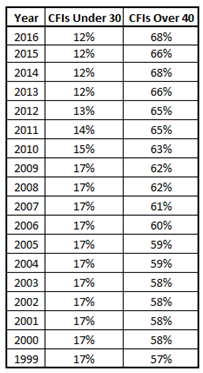 This strongly illustrates the effect of turnover over a period of time to keep positions staffed. It becomes an exponential staffing effort. This turnover and the limitation on who can train new CFIs further exacerbates the constriction of employable CFIs for flight training providing businesses. These businesses are finding that the pool of CFIs to be largely tapped out as hiring by airlines became aggressive and are the same time unable to train CFIs internally due the fact that the turnover has left them with few experienced CFIs who meet requirements to train other CFIs. With this all in mind, these conditions are affecting the overall ability of flight training providers to increase or even maintain overall pilot training throughput in our aviation system. Flight instructors and the ability for flight training providers to employ and maintain sufficient numbers of flight instructors is currently a restriction on the overall pilot training output within the U.S. flight training system. This leads us to a question of how to attract and keep flight instructors in flight training businesses. Recruiting and keeping CFIs, like in any other profession, requires that successful recruitment and retention is based on human resource management principles that are fundamental to employee job satisfaction. If we are honest with ourselves, the job of the average CFI has traditionally been lacking in its ability to meet many of the qualities that make the positions ones that staff desire to stay on for the long term. Historically, most CFIs are paid hourly in direct relation to the number of ground or flight hours billed to the customer that they directly provided. Many times they are not even paid as employees with taxes withheld and matched by their employer, but are considered “contract” employees and fully responsible for their own taxing responsibilities to say nothing about the provision of benefits beyond their hourly compensation received. Flight training providers have considered them transient staff for whom it wasn’t worth putting the effort into any other benefits or long-term employee retention plans. Without compensation beyond basic hourly pay, most CFIs enter into these positions only as a stepping stone on which they stand just long enough to get enough experience required to get them to the next job. For many, this is as a professional pilot in jobs where they are more likely to be offered additional benefits. Unless the compensation and retention practices at flight training providers changes, this structure will continue to encourage CFIs to transition out of these positions as quickly as possible, a situation that is happening at this time with active airline hiring in the current economy. This leaves the flight training providers footing the bill for continued staffing turnover, which can be a costly thing for a business. 2. It affects the performance of an organization. In an industry that is experiencing a shortage of CFIs for professional training providers, not getting a handle on this will limit an organization’s ability to deliver the product of flight training that is highly dependent on direct staff provision of a product to customers. Certainly, a more competitive compensation is helpful to attract and keep CFIs from moving on to other employment opportunities. This doesn’t just mean paying more dollars per year than a pilot might make at an airline. It is more about an overall compensation mix coupled with a reasonable pay level and a quality of life that is agreeable to employees. In CFI pay surveys that I conducted with both the National Association of Flight Instructors and the Flight School Association of North America, it was found that only small percentages of respondents (CFIs) received such basic compensation items such as medical benefits, paid time off, or even salaried pay structures. These just have not been items that have been included in compensation packages for flight training providers who are CFIs at small operations, many larger academy training environments, and even for many of the “line” CFIs that are not full time “faculty” at collegiate and/or university training providers. In absence of anything other than a base hourly wage directly associated with the number of hours of direct contact with a customer, it is no wonder that CFIs actively seek to transition to alternate employment as quickly as possible. This doesn’t mean that a flight training provider has to pay more dollars yearly or necessarily match the benefits packages that a major airline can pay its pilots to enhance its retention of CFIs. In fact, I postulate that all they really need to do is provide a benefits package that makes the CFIs question whether it is worth leaving their current CFI employment to take an entry-level professional pilot position. In recent years the industry has seen a ratcheting up of regional airline pay to attract CFIs and other experience qualified pilots to positions with these regional airlines. In many regional airlines, this increase has been significant (see the AIN Online article, Starting Salaries On the Rise at Regional Airlines at https://www.ainonline.com/aviation-news/air-transport/2016-12-22/starting-salaries-rise-regional-airlines) and has become a major factor in CFIs decisions to leave CFI positions to go work for airlines. When the option of working for a flight training business with no additional benefits is weighed against going to work for an airline that pays more dollars per year along with benefits, the choice for an individual becomes a “no-brainer”. As this pay level has been increased at entry level airline positions, a fundamental pay relationship that existed previously was upset. In recent times, for many CFIs, they would be accepting a pay reduction when they left full-time CFI work positions to go work for an entry-level airline. Asking a professionally trained individual to take a pay cut “to advance” in their industry is somewhat counterintuitive but was required until the recent aggressive hiring with increased compensation packages developed. The previous condition caused more CFIs to stay in professional flight instruction positions for a longer period of time than is currently being experienced. The problem can be solved by again developing a condition in the industry where full-time CFI staff would receive compensation packages that caused them to “think twice” before accepting employment in a professional pilot capacity that may perceptibly “advance their career” but would result in at least a short-term reduction in pay and potentially a lower quality of life. So why would a CFI stay in a CFI position instead of moving on to a professional pilot job? There are lots of reason that could be considered if reasonable compensation packages were presented to CFIs. A savvy flight training business could take advantage of this current CFI constricted market by increasing base pay to equate or exceed first-year hiring pay at regional airlines and additionally add other compensation matrix items that are missing from many flight training providers such as medical benefits, paid time off, educational options (at collegiate and/or university providers), or other items that are commonly provided in industries other than flight training. While some providers have attempted to provide “free training” or even things such as free master’s degrees, these items are not enough if the base pay is not comparable to entice employed CFIs to accept these offerings if it is additionally perceived that leaving their current position will result in an increase in take-home pay along with furthering their desired career path. One major factor that can also be leveraged by flight training providers is a consistency of schedule and the ability to be “at home” more frequently for professional CFI positions. For employees to which this is important, this can be a significant enticement to staying employed as a CFI instead of moving on to the less predictable schedule of working as a professional pilot that additionally leaves the employee away from home more frequently. Having a stable home life, not commuting to work across the country, working with same staff on a regular basis, and a consistent work schedule is desirable for many employees. A flight training provider that leverages these factors, supports them as a part of the compensation process, and hires employees for whom this is a value, is likely to find that their turnover is going to be minimized. This doesn’t all mean that a flight training business needs to pay an exorbitant wage to CFIs, but it does mean that it needs to at least be competitive with other industry jobs. A basic factor in making this competitive would be to make professional CFI positions salaried to increase the stability in the employee’s minds of their position, their compensation, and their value to the organization for whom they work. Many training providers have avoided making a CFI a salaried employee. They cite the transient nature of the employees and the inability to control wages paid to employees in relation to the revenue generated by hourly billing to their customer. This argument is usually a sign that a business is unable to manage employee hours worked in relation to hours billed to a customer, the trademark of a poorly managed business. By no means does this mean that a flight training business should not track hours billed by a staff member in contact with customers. If a flight training business is paying an instructor to work 40 hours per week as a salaried employee who will be working with customers and finds that they only billed 10 hours, it means that there is an effective breakdown in the employee efficiency in their position. Any employer (in any industry) would be right to evaluate productive work time being delivered by an employee and seek to make changes to the employee’s work or their employment status when they weren’t delivering the work they were expected to deliver. But it does mean that a mature business should work with its staff to determine reasonable averages of hourly billing cycles with customers and based on this could develop a more stable salaried pay structure for its full-time CFI staff that may further attract and longer retain these staff members by offering a more stable compensation structure. The best part? Flight training providers don’t need to get all of the CFIs to do this, just a small percentage. If a business is experiencing turnover of its CFIs every 9 months, but can develop a compensation package that will attract and retain a number of CFIs for a longer period of time, let’s say for 5 year stints as employees, it means that the business only needs to find 17% of the CFIs it would traditionally have recruited that want to stay for a longer period of time (if the business has to replace a CFI every 9 months, it will replace 6.66 CFIs over a 5 year period, 1 CFI instead of 6.66 equates to 16.6% of the staffing requirement). In effect, a business needs only to convince 1 in 5 (conservatively) of its historically employed CFIs that staying on with their business at an increased compensation package is worth doing instead of taking a “pay cut” to go to an airline. It is even possible that with added CFI experience (and probably some multi-engine CFI experience) that over time, these CFIs may be able to skip a regional airline time building job and be directly hirable by a major airline if proper relationships can be established. The benefits of developing a compensation structure that provides greater rewards to the employees is likely to lead to greater staff retention, reduced costs in staff recruitment and training and may also help those staff members gain experience that will enhance their own careers more effectively. It can be a win for both staff and the employer. The flight training industry is going to need to more effectively recruit and retain staff if it is going to curb the turnover in its CFI employee population, the staff that is directly and fundamentally the resource that provides the services that flight training businesses and academic institutions are providing. Staff retention has been found in most industries to increase overall profitability, as turnover of staff costs a business in many ways. Any number of human resource management articles can highlight costs and effects of turnover of staff positions, but there are some specific considerations that are directly applicable to flight training operations. When a flight training provider standardizes a new flight instructor, especially at structured and part 141 training programs, there are specific training items that are completed and conducted prior to allowing that CFI to provide services to customers. In most cases, this includes direct staff time that is dedicated to working with the instructor and asset time (typically aircraft) that is utilized in this process. There are direct costs associated with this effort and indirect costs that are less regularly computed if a business were to calculate the loss of time a staff member spend with the new hire that could have been spent with a billable customer. The more frequently a flight training operation experiences staff turnover, the more frequently these costs are incurred and the more overall profitability is affected. Along with this, staff turnover decreases the efficiency of training provided to customers. While some will argue that if customer efficiency is affected in flight training it has little overall effect on profitability because customers are billed hourly, this is an incomplete argument. Delays in training actually decrease overall profitability because a flight training operation will find themselves to be more profitable overall by completing more students in expected training footprint times than dragging out extra time for a few hours per student. This will create delays in the ability to bring in new customers. Additionally, in some cases, training is not conducted on an hourly billing basis but a contracted “per rating (or certificate)” billing cycle and any additional delays or extra flight times incurred directly affect the bottom line profitability of a flight training operation. Customer efficiency is one directly affected cost but another is the indirect cost of having less experienced instructors. Less experienced instructors are more likely to result in higher failure rates of students on practical tests. Higher failure rates increase costs to customers and delay training transitions to more advanced ratings and certificates or new customers. A flight training operation that is able to retain more experienced instructors is likely to have greater pass rates for its customers in their flight training testing. All of these things cost a flight training business real dollars in their operation. An ability to retain staff who have more experience for a longer period of time will directly reduce staff recruitment, training, and transition costs. A stable CFI staff will directly increase the success of the customers in the training that the businesses are provided. CFIs are valuable pieces of successful flight training business models and managing them properly is fundamental to the human resource management portion of a business endeavor providing flight training. So, isn’t it time that flight training businesses recognize that these effects are something that successful businesses in many other fields have learned? It is time for savvy businesses that provide flight training to transition to an innovative business model that will allow them to provide a more stable service to their customers. It is possible that this transition could even result in a more profitable business model in the end while at the same time strengthening the professionalism of the flight instructor core of the training industry. If flight training provider businesses don’t mature in the business model as to how they handle their human resource of CFIs, and just continue to consider them interchangeable cogs of which there is an unlimited supply, it will affect their ability to provide the training their customers are seeking and result in unstable staffing and an inability to meet the needs of the customers. This directly affects the bottom line profitability of a flight training provider. The question becomes can flight training businesses increase compensation packages to attract and keep instructors for longer tenures as employees? Can You Afford Not to Pay Your CFIs More – Retaining CFI staff by increasing their compensation while minimally increasing customer costs. Over the past few months, there has been an increasing complaint by many flight training providers that they can’t find and keep enough flight instructors for their training operations. This is not limited to the smaller local providers and it is not something that we can ignore because it has real effects on the business of flight training. Flight training providers that cannot attract and keep instructors are forced to incur repeated training expenses with instructor turnover or limit their training classes based on their ability to have enough instructors to train customers. This creates a constriction in the training pipeline for future pilots in our aviation system. The cause of instructor retention problems is rooted in active airline hiring at higher wages than historically experienced, with the largest number of CFIs being attracted to and hired by regional airlines that have been increasing pay and incentives to recruit pilots that they desperately need. (To learn more, see the article in Aviation International News – Starting Salaries On the Rise at Regional Airlines. – http://www.ainonline.com/aviation-news/air-transport/2016-12-22/starting-salaries-rise-regional-airlines) This has trickled down through the industry to the CFI employment realm and is causing short-term service by CFIs who are actively being recruited to positions in the industry (mainly regional airline pilot positions) that offer higher pay and better benefits. If we follow the logic of airlines being able to attract more pilots by offering better pay and incentives, the same will hold true of CFI employment. If pay is increased it will result in increased retention and decreased turnover of CFI positions for flight training providers. Now, I want to clarify that “pay more” isn’t just a matter of more pure dollars, but a matter of considering a total compensation mix for an employee. Take-home pay is a part of this, but consideration must also be given to things like health care benefits, days off, a job that doesn’t require being gone for many days, no commuting to a job like many airline pilots do, etc. These are all benefits that may convince a CFI to stay in a flight instruction job as a career choice instead of just as transitional step to a job that has many of these benefits. Many flight instruction providers do not provide additional benefits other than hourly pay for hours worked. This is something I have seen in working CFI pay surveys over the past years with two different organizations – NAFI and the FSANA (visit NAFI Study Finds CFI Pay Is Insufficient – http://www.flyingmag.com/news/nafi-study-finds-cfi-pay-insufficient and 2016 FSANA Flight Instructor Compensation Survey – http://www.fsana.com/news-2016-fsana-flight-instructor-compensation-survey for more information). For the most part, flight training providers have yet to treat their CFI positions as career positions for which they develop compensation matrices that will attract and keep the best CFIs to those positions. When asked why they don’t, most business operators indicate that they can’t pay enough and remain competitive with their customer pricing. I think that is a short-sighted answer, and one that I would like to try to convince flight training providers is being given from an uninformed position. It is my belief that for career-focused training environments that have large instructor staffing needs and many students who need training, the training provider will not be able to survive, remain competitive, and grow in the current environment that is looking for training providers to produce more pilot certificate holders to feed active hiring. You may be thinking to yourself, “Sure, I’d love to give my instructors a raise, but I don’t see how that can be done without increasing the cost of flight training to an unsupportable level.” While increasing instructor compensation may require an increase in the cost to the customer by a small percentage, their quality and efficiency of training will likely outweigh that increase. To get a better idea of how much of an increase might be required, I modeled what a simple dollar increase in wages might represent for an instructor comparing a current wage and a desired yearly salary to conduct the same number of hours of training. The result was a little surprising. 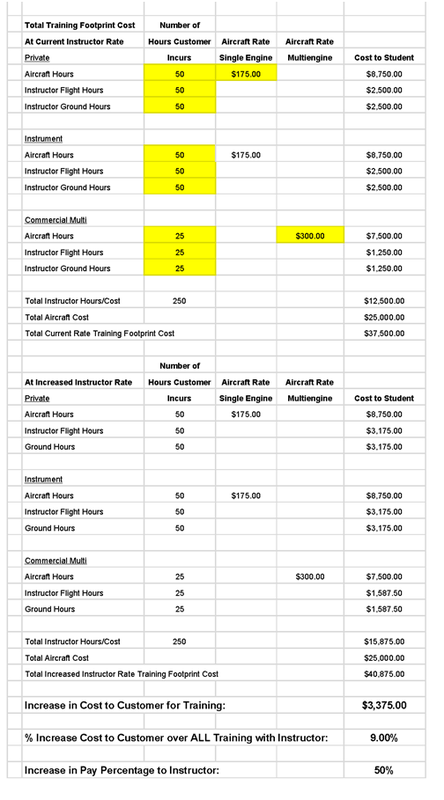 The percentage increase on an exemplary training footprint with average instructor and aircraft pricing that is representative of what many flight training providers may experience resulted in an increase in the overall training cost to the customer, but one that with consideration of other factors may actually be mitigated and/or acceptable. Here is the example that I ran. 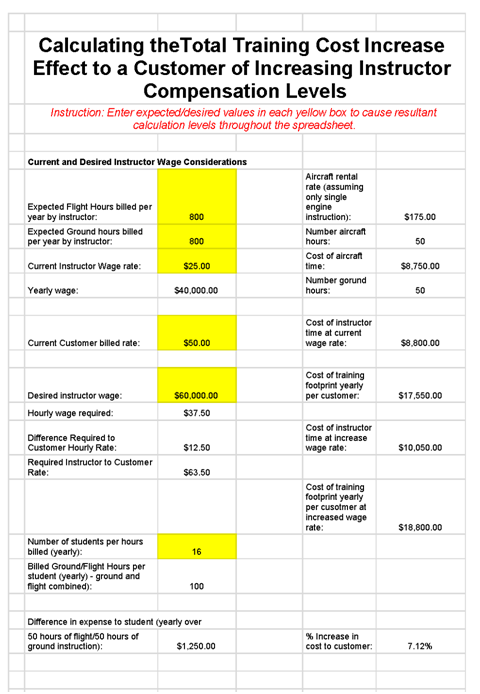 In the example we find that a pure increase of wage for the instructor (with some basic assumptions of employee tax withholdings and similar concerns built into this calculation) increases the overall training footprint cost to the customer for something like a private, instrument, commercial multi-engine training footprint in a much smaller percentage than it does provide the effective increase in pay percentage to the instructor. This is all based on the incremental effect of the direct hours of instructor time relative to all the other factors included in the training footprint cost to the customer. Now, I will qualify that this spreadsheet is certainly incomplete. It doesn’t include things like medical benefits, paid time off, etc., but it does give us a basic exemplar from which a savvy flight training provider could expand the considerations of the sheet to more accurately reflect their own operation to include all of the factors they might need to develop a fully representative calculation for their own operation. In fact, I highly recommend any flight training business that have not done this, do it as soon as possible to get a better grasp on their staffing costs relative to training pricing. When considering the increase, and considering customers that are career-focused, the pure dollars increase in the training footprint may actually be less relevant than one might think. Many customers don’t shop just on the “lowest cost” training they can receive, but consider things like training time it will take to accomplish their goals, if financing is available, and success rates of the training provider’s customers at completing the training. These factors easily could, with proper marketing, allow a flight training business to attract customers and convince them to spend their money at a training provider that “sold” them training for $40,875 instead of $37,500 for an increase of cost of $3,375 if it meant they were likely to have a higher success rate at completing the training with more qualified instructors who have a better pass rate. Paying more may actually come with other benefits for the flight training provider. With better pay it is more likely that instructors will stay longer, resulting in less turnover costs for the flight training provider and more experienced instructors providing training to customers. The direct benefits of this should be obvious to a training provider. Less turnover means less cost of training (standardization) of instructors into their operation. For many training providers, instructor turnover rates are currently running approximately 9 months. If we even consider that a minimum of 5 hours of aircraft time (3 in the single-engine and 2 in the multi-engine aircraft) and a little time with a senior instructor (5 with the single-engine and 4 with the multi-engine aircraft) to on-board a new instructor into a training operation, and using the considerate numbers from above, the training operator would incur a basic cost of $1,650 for each instructor they have to bring on when one leaves. This doesn’t even consider loss of revenue or productivity, orientation, administration, drug testing, and staff time associated with recruiting new employees to name only a few considerations when transitions happen. These are all very real costs to a business. Check out the Society of Human Resource Management’s article, Placing Dollar Costs on Turnover at https://www.shrm.org/resourcesandtools/hr-topics/behavioral-competencies/critical-evaluation/pages/placing-dollar-costs-on-turnover.aspx to get a better feel for what turnover costs really mean to businesses). With that in mind, the number I used above in the turnover cost is actually a very minimal standardization footprint being offered, many training operators have much more extensive requirements. The real cost is probably more like triple the number I cited above for the direct hard costs. Turnover is expensive. Most businesses have figured this out, flight training has yet to recognize how expensive it really is and make the changes other more mature business environments have done to minimize their staffing costs. Perhaps it is time out industry grows up in that way. Any changes a business makes will come with intended and unintended consequences. Paying CFIs more will certainly come with both. Some we can easily identify, such as a better compensation to the CFI employees causing them to stay longer and provide more stable service to our customers. Others will be harder to identify, may not even be visible until major changes in the industry are made, and some may, in fact, have effects on other parts of the industry. If the flight training industry takes to heart an effort to pay instructors more and try to keep CFIs in their employ for longer periods of time, it is likely to have the effect of finally creating a cadre of career-focused and dedicated instructors who will become a nexus of professional training for the industry. The transient nature of the CFI position has limited the number of people who do this to largely those few senior staff and academic positions in the industry at collegiate/university/and academy style training providers historically. This can only improve the overall quality of training as these individuals gain more experience and not leave their CFI positions to go “be a pilot” at a “better” job somewhere else. I would be remiss if I didn’t mention one unintended consequence that I believe would also result, and that would negatively affect (primarily regional) airline hiring efforts. If instructor positions become less transient and CFIs spend longer portions of their careers in these jobs, it means it will be less likely that the airlines will be able to actively hire as many CFIs to their hiring needs. Even a small change in the turnover of CFIs to pilot hiring positions will have a great effect. If you are a flight training provider and want to see what this basic model would look like for your business, click http://jasonblair.net/?page_id=1819 for an interactive spreadsheet that you can input your own business considerations into for comparison. Considering the fact that turnover of CFI positions is in almost all cases right now nearly a yearly thing, if a flight training provider could pay competitive wages that caused CFIs to work in their positions for longer periods of time, it would cause less overall numbers of pilots to be able to “get” CFI jobs and gain the necessary experience required to qualify for other pilot employment minima (such as part 121 airline service). There will certainly be pilots who do not wish to be CFIs as a permanent job, but some may choose to do so. If we imaged a few pilots, even 20% of them, willing to do this for maybe 5 years at a time before moving on, it would mean that instead of 5 instructors getting a job for a year, only 1 instructor would have that job for 5 years. This effectively blocks 4 instructors over that time period who may have gotten the job that would develop the 800-1000 hours of flight time in a year needed to move on to fly at an airline, and instead gives one instructor who took the job for a longer period time something more like 4000-5000 hours of total experience over the same period of time. If this bears true, it means that developing a well-paid, experienced, and more stable cadre of instructors will actually reduce the potential positions that would be open for pilots who are seeking to gain necessary experience to work for airlines. In some respects, this is a negative impact on the overall aviation industry, but from a flight training business perspective, it may be the necessary change to ensure their survival. It isn’t the job of the flight training providers to “be the experience building” for pilots, it is their job to provide the training to accomplish certificates and ratings that are needed. The goal of a flight training provider should be to pay a wage with sufficient benefits to their CFI staff that will make them actively decide not to take a job at another type of pilot position such as a part 121 carrier or corporate/private aircraft pilotage. When this is accomplished, the flight training providers will achieve stable employee retention, reduce turnover/standardization costs in their employees, and develop more experienced CFIs that will reduce failure rates and training time footprints for their customers. The end result may actually be a reduction in costs in some large-scale training provider environments. Many flight training operations managers will immediately disregard this discussion and say that they simply can’t pay more for instructors and make a profit. In some cases, this is probably true. But in other cases, it may actually be the case that to survive they can’t afford not to change their business model and pay a more competitive wage. Small flight training operations that do not have a large student base or overhead (facilities, aircraft, etc) base over which to amortize higher costs of instructor pay may find that is not a manageable option for them to sustain. While this is the case, and while it is unfortunate, it is likely that from a big business model of throughput pilot training, these providers will not be able to compete with larger operations in the future. It does not mean that the training that they provide isn’t valuable, but it may be focused differently and to different markets than purely career pilot driven customer markets seeking training. Larger training operations generally fall into two major sectors, academy style commercial training providers who seek to move students through certifications and ratings in set time footprints, and collegiate/university training providers who move students through training for ratings and certificates in time footprints associated with academic degree programs (whether 2- or 4-year programs). Each of these has strengths and weaknesses in the training provision and the hiring relationships with airline employers for their graduates, but each also has strengths and weaknesses associated with the business model of how they provide training also. Colleges and Universities are some of the largest providers of flight training for individuals seeking career employment as pilots are colleges and universities. This is based on the fact that many airlines actively hire graduates of these programs, and as a part of that hiring, graduates of these programs are employable by airlines at lower total hours of pilot experience than pilots who complete pilot certifications outside of these programs. While these programs have highly successful and structured approaches to pilot training, they also have equally structured compensation systems. These may require that training departments adhere to collegiate/university faculty pay structures. This structure could potentially inhibit their ability to implement any direct pay increases that are significant for CFIs who are providing training to their customers. To do so could represent breach of faculty pay structures or undermine potentially other long-term staff positions. This may place non-collegiate/university business-oriented training providers in a somewhat advantageous position if they choose to increase pay for CFI positions based solely on market demand pricing in an effort to attract and keep for a longer period of time their core CFI staff. Should these providers take advantage of this position, they would be in a position to employ more CFIs, provide more stable and efficient training to students, and market this ability to attract more customers. The traditional detractor for these training environment graduates is that they have not had a collegiate/university “degree” that many mainline airlines require for hiring, but as hiring practices for airlines change, this could be less of a factor in the future. Additionally, for any students of these programs who already have academic degrees or pursue them at colleges and/or universities outside of their flight training, it becomes a moot point. This doesn’t mean that increased compensation options aren’t possible in the collegiate/university environment, but it does mean that it may have to be more creative than just purely more dollars to the staff member. It may have to come in the form of things such as employer relationships for hiring into airlines based on years of service with a particular flight training provider, could include considerations such as payment of student loans or training debt, or other similar types of “soft” compensations for a potential CFI who would commit to longer employment with a particular training provider. Large training providers may choose to pay pure dollar increases or other “soft” benefits as they seek to increase compensation to CFIs in an effort to attract and keep them as staff. I have no doubt that there will be creative compensation packages that include benefits we have not seen in many instances historically. I by no means can claim that I know what these will all be or even which will be best for certain environments, but it is something our industry should watch and consider carefully. Our industry is seeing a shortage of instructors due to turnover caused primarily by increasingly more aggressive airline hiring. Many businesses that provide training require more CFI staff than they are currently able to hire. This causes them to have less staff available than required to meet the demand of customers seeking training for professional pilot careers. Unless this demand ebbs, the ability to meet the demand will necessarily cause training providers to work to solve the CFI staffing question. The flight training industry has come to a point where it may be able to actually transition a portion of the CFI community to a more permanent cadre that is compensated at equivalent levels as other professional pilot positions within the industry. One might question if there are enough of these instruction minded individuals who would stay in professional teaching positions. To some degree, as the financial model changes, more will be motivated to do so. But in reality, it is a small percentage that would be needed to be convinced if turnover were curbed. While difficult to measure, based mostly on anecdotal conversations, there are certainly reasonable numbers of professionals in the industry that would actually prefer to be professional flight instructors under the right conditions as a career. This does not mean that they have to be paid more than they would if they were senior pilots for major airlines, but that they would consider many of the non-compensated benefits such as work schedule or being at home more frequently if they were paid reasonable wages instead of low wages typically paid to employees considered transient. The businesses that provide flight training will continue to change their methodologies of providing staff for training as long as there is a market seeking that training and money to be made providing it. These businesses will modify their staffing needs and in some cases, develop or adopt new technologies to deliver this training in profitable ways. Staffing constrictions will likely result in changes, some of which as proposed above, to ensure continued provision of training to customers and through stabilizing staffing resources. While the position of the CFI is a crux point in our industry, it is also a potential weak point when it comes to ensuring the ability to provide training and to produce enough pilots to meet the hiring demands of the rest of the aviation industry. The experience that pilots gain as instructors is critical to meeting hiring minimums for many aviation jobs and the stability of the CFI community is critical to being able to train future pilots. If our industry is unable to stabilize the transition of the CFI position, the effectiveness of the overall training pipeline and its ability to continue producing pilots with the experience to move on to other positions is in jeopardy.